It’s summertime, which for many means travel season. Whether you’re flying to see relatives, going on a cruise or taking the car out for a road trip, look over these tips to keep you safe and healthy during your summer travels. Tell friends and family where you’re going. If you plan to travel alone or even with your spouse, let your children and neighbors know where you are going and how long you will be there. Your neighbors can look after your home and your family can check in on you every couple of days to make sure everything is okay. Update and carry extra medication. Before you leave on a trip, make sure you have more than enough medication to last the duration of the trip. Also bring a list of your current medications, allergies and emergency contacts to carry with you at all times during your travels, in case of an unexpected emergency or doctor visit. Pack a carry-on. Set aside a snack, 3-4 days of medication, a change of clothes and some small essential toiletries to carry with you on the plane or within easy reach in the car. Beat the heat. If you are traveling to a very warm area, stick to the shade and drink water throughout the day. Airplanes use an air exchange system that causes dehydration, so be sure to drink water before, during and after your flight. If you feel dizzy, nauseous or get a rash from the heat, seek medical attention. Take breaks. If you’re flying, take a walk up and down the aisle every hour or so to stretch your legs out (as long as the seatbelt light is off). If you are driving to your destination, take frequent breaks to get water, eat, stretch, use the restroom or sleep as needed. Check for discounts. 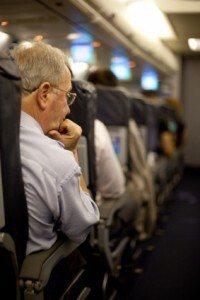 If you or your traveling companion are over 65, you may qualify for discounts with airlines, trains or car rentals. Ask for assistance and let others help you. If that means accepting a wheelchair ride at the airport or asking someone to fly with you, your safety comes before anything else.